Cooking with garlic is always an interesting experience. Garlic, of course, can be extremely powerful, can be sweet and subtle, can be heavily aromatic, can be just the right touch to ‘complete’ a dish, and can completely destroy a meal when burned or used excessively. In my personal opinion, if you’re going to use garlic in your food, then make sure to use enough. A ‘dash’ of garlic or a pinch of minced garlic won’t really do too much. The key is to treat it properly. Garlic’s potency, or power, seems to be directly related to how it’s treated. If you brutally smash the garlic before cooking, it will be more assertive. If you flash fry it in high heat, you will result in a harsh ‘in your face’ garlic flavor. Gently sauteing and slowly caramelizing garlic will result in a sweet and mellow product. Slow roasting it in olive oil, protected from the direct oven heat will again result in a sweet, fragrant and much less abrasive product. When I cook with garlic, I prefer the latter; a sweet, non-abrasive addition, lending a fragrant and gentle component to my cuisine. 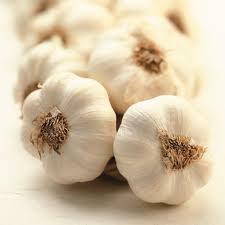 I like the slow roasted whole garlic, garlic confit, slow simmer garlic, or gently sauteed with olive oil and pepper. And therefore, to pronounce it in whatever dish I’m making, I need to use a lot. Garlic seems to be a foundation in so many cuisines. Many Italian dishes start with garlic and onions. Chinese cuisine utilizes garlic in more dishes than not. Beef braises, brines, marinades, soups, stirfries… you name it, it probably has garlic. Many times, the garlic is either over pronounced, or lost within other complex flavors. Hopefully this one easy recipe will show you one way to truly embrace the ingredient, giving you a great new technique. This recipe may appear Chinese in the beginning (garlic and shrimp sautee), but lies somewhere between Chinese and French. It’s easy, fast and is a great recipe. In a heavy bottom sauce pan, begin heating the olive oil over medium low heat. Add all the garlic and turn heat to very low. Stir frequently. Let garlic cook slowly, becoming tender and fragrant. This will take about 10 minutes. You do not want to put any color on the garlic. If the garlic begins to brown slightly, turn heat even lower. Once the garlic is highly tender and sweet, add the crushed red pepper and shrimp. Toss everything together and turn heat to medium. Season with salt and pepper. When the shrimp just begins to turn pink, add the brandy and turn heat to high. Reduce until au sec, or almost completely dry. Squeeze the orange into the pan, and reduce to almost a glaze. Turn heat to low and swirl in the butter. This is richen and thicken the sauce. Remove from heat, add the scallions, and serve right away. Best served with roasted potatoes, steamed vegetables or jasmine rice.